The Giant Buddha of Kamakura. Photo by Fabrizio Giordano / Flickr. 1. Wake up and put on your favorite outfit – it's gorgeous, and you're going to the seaside. Pictures will be taken. 2. Go crazy with breakfast. Japan has some of the most exotic flavor profiles the Western palate can experience, and it pays to experiment. I would recommend a piece of fruit you do not recognize and a pancake beverage from one of the sprinkling the streets of Tokyo. Let me be clear: This is hot, liquid, pancake in a can. If you're like me, novelty occasionally (okay: often) trumps taste. 3. Start with a little art. Take the famed Tokyo subway to the Gaienmae stop on the (the oldest metro line in Tokyo, it's the least far underground and the most accessible). It's a five-minute walk through Gaienmae, a mixed commercial and residential low-rise neighborhood, to , a jewel box of a museum with a killer art and design shop. I saw an exhibition featuring Sou Fujimoto, a prominent up-and-comer on the Japanese architecture scene. The gallery is spread over three miniscule floors, and the retail space is curated and fruitful. I scored miniature paper city tableaux, rock magnets made of rubber, obscure books on Asian contemporary artists, and furniture made of exquisite layers of colored paper pulp. 4. Break for lunch. Tokyo residents are quite taken with pastry à la Française, and the bakeries do a more than decent job replicating French breads both sweet and savory. 5. Head west to Shinjuku Station. Take a minute to take it all in: This is the busiest transportation depot in the world. You'll catch the JR Shonan-Shinjuku Line by the sea. The former Imperial city was founded in the 12th century, before the emperor moved his digs to Kyoto and long before Tokyo became the capital. The train costs less than 900 yen and takes roughly an hour. (Pro tip: Wait for a Zushi-bound train, and you won't have to switch trains.) Kamakura is popular with elderly tourists and groups of schoolchildren, which always guarantees extra cute people-watching. Its location on the inland cove of Sagami Bay protected it from the March 2011 tsunami that devastated the Miyagi prefecture 275 miles to the northeast. 6. Disembark at Kamakura Station and exit to the south. On the right side of the square is a bike rental outfit which charges around 1500 yen for three hours. The village has several heady tourist attractions, and they're all cheap and within easy cruising distance. You can mix and match the stops — basically, anything you see here is going to blow your mind — but this is my suggested order. 7. Zeniarai Benten: Enter through a tunnel carved into a sheer rockface and wash your money in the shrine: Legend says you'll double it. The five-yen piece is considered lucky on its own. "Go en" is the word for "five yen" and "fate." It's the most common currency donated at shrines. 8. Hasedera Temple: In 721 AD, the resident monk found a camphor tree big enough to carve two statues of the goddess Kannon. The monk sent one to a temple in Nara and threw the other out to sea. It washed up on shore fifteen years later, and the people built this temple to house the statue. Did I mention it's painted gold? The temple sits atop a hill that overlooks Kamakura and Sagami Bay. By the way, a shrine (Shinto) is not the same as a temple (Buddhist). , and you may as well . 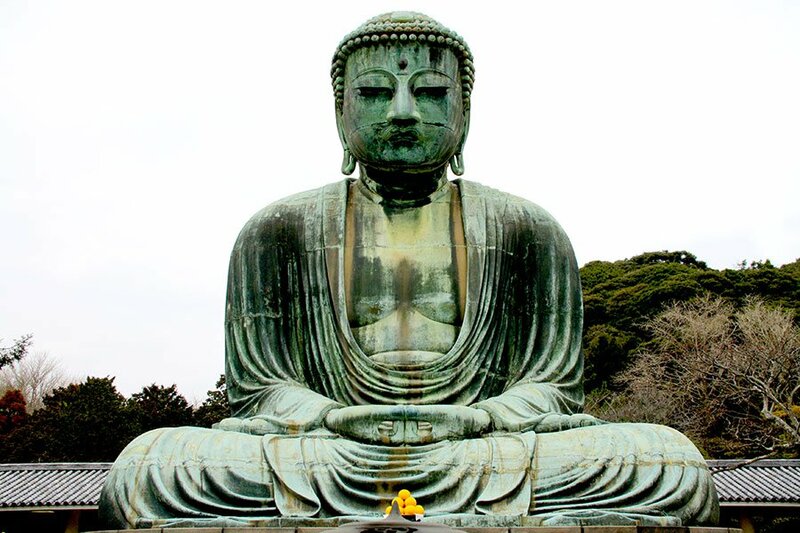 9. : This fellow is about three stories tall, making him the second largest Buddha in Japan. Visitors can climb inside for paltry 20 yen. The Buddha was cast in bronze in 1252, and you learn a little about the construction method by examining the trusses and seams inside. 10. Now consider yourself cultured and hightail it down to the promenade along Sagami Bay to bicycle westward down the brick boardwalk overlooking Mt. Fuji in the distance. If you've timed it correctly, you'll see the sun set over Japan's highest peak. If you've still got time to kill, noodle around the residential neighborhoods approaching the beach. The shutter systems here are especially ingenious. 11. After returning your rented bike, mosey over to the main shopping street, — it's to the left of the train station and decked out with ribbons and swag at the entrance — a tiny alleyway chockablock with food samples, crafts, and Japanese food both authentic and touristy (look! conveyor belt sushi). Snack your way around the pickle shop (radishes, carrots, seaweed, anything) and pick up exquisitely wrapped chestnut candies in the confectioner's shop. Knickknacks abound but, hey, it's Japan, and almost everything is precious. 12. Take a nap on the train ride back to Tokyo. I heartily approve of any country where sleeping on trains is not just acceptable, it's the norm. is an editor working in New York City. Follow her on Twitter at or on . She travels for the architecture-spotting, hotel bathtubs, local candy, and varied weather forecast.